Time for some Tech Talk or Geek Speak to answer this reader’s question for the benefit of all concerned. I have seven chapters and ninety-three pages in my memoir now, and I’m having a terrible time moving around the document. I tried separate files for each chapter, but with seven chapters and counting, even that’s a mess. And I’m a real klutz at moving chunks of text from one place to another. What can I do? Tah DAH! Help is at hand! That help is in two little-known features of Word: the Navigation Pane and Outline view. Let’s take a look. I keep the Navigation pane (or Nav pane as I call it for short) open all the time when I’m working on a long document. Press F12 in a Word document to open it on yourself (or click on the View tab, then click the box next to Navigation Pane). The gray area in the image above is the Nav pane. I can jump to anywhere in my document, whether it has four pages or four hundred, by clicking on one of the items. The arrow points to the section seen at the right. Of course you will not have that red arrow on your screen, but you will see the blue highlight the arrow points to. If I click on Get Off Your Buts and Write!, I’ll instantly be at the top of that chapter. Here’s the deal. The Nav pane works with Style defined headers. The items above with arrows beside them are chapter titles. Each chapter title has a Heading 1 style attached. Indented items are sections. They have a Heading 2 style. 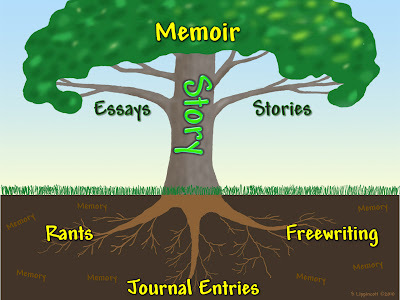 This won’t be as much help in a memoir, because your only headings will be chapter titles, Heading 1. But being able to jump from one chapter to the next will help. And here’s an idea for the adventurous: you could use section headers for your working document and delete them for final copy. Don’t throw in the towel if your eyes cross at the mention of styles! Believe me, you can learn enough in five minutes to save hours and hours of frustration finding your way around your document, and it will be easier to format later. Here’s the deal. Go to YouTube and search for “using styles in word 2007.” For best results, substitute your version number for 2007 if it’s different. Scan the search results and find one that looks promising. You might want to try two or three. In Outline view, the Nav pane remains open, but it has a white background so you won’t be confused. In Outline view, you can move chunks of text slick as a whistle. In the view above I have all text displayed. The red arrow points to the round bullet next to a paragraph I want to move. When I triple-click a paragraph or hold the cursor over the bullet, the paragraph background turns gray. When I hold the cursor over the bullet, it turns into a four-headed arrow. When the cursor is in that arrow form, press and hold the left mouse button to drag the entire paragraph into a new position. As you move it up or down, you’ll see a fine horizontal line between paragraphs that show where the one you’re moving will end up if you let go. Spacing will automatically be adjusted. No need to fix extra paragraph breaks, etc. If dragging with the mouse is awkward for you, or you’re stuck with a laptop touchpad, use the up or down keyboard arrows to move it one paragraph at a time. You can also highlight a paragraph and use cut-and-paste to move it to a spot too far away to easily drag. Place your cursor at the beginning of the paragraph beneath and paste. Again, all spacing will be adjusted. By the way, you can highlight and move multiple paragraphs the same way as long as they’re adjacent. The green arrow points to the outline tools that manage your view. By default the Show Level field is blank and everything shows. Click on the arrow at the right end of that field and you’ll find a number of options. If you want to move entire chapters around, select Level 1. I often work at Level 2, letting me reorder sections. One other time Outline view really shines is for reordering bullet or numbered lists. Leave the Level view at default (or select All Levels found at the bottom of the list). Move list items around like paragraphs. Numbering will be automatically reordered. The blue arrow points to the Close Outline View button, the easiest way out. Please note: the Close button only shows on the Outline tab, and that tab is only there when you are in Outline view. While these panels and views aren’t much help for writing simple short stories, but they can be a life saver on longer projects. Take three minutes to explore them. You’ll be glad you did! What Word tricks make your life easier? Good stuff, Sharon! I'll have to give those a try. And you know me--I'll share this with others writing their memoirs! Thanks. Thanks, Sharon! You truly are a Word Wizard!! Linda, I found the nav panel years ago, but only recently remembered to start using it. Ditto with outline view. Please do share. What a shame not to use all the tools we have, especially such simple one. My pleasure Amy. I enjoy digging around in dark places and finding buried treasure. It's even more fun to pass it along.